How Do I Use My Firefox OS Device as a Modem to Share My Internet Connection? Firefox OS, though a fairly new mobile phone on the market, offers numerous features that are available to both Android and iOS. One of these features is the ability to share its internet connection. 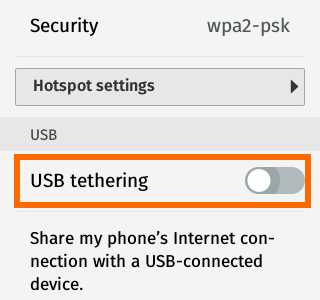 By enabling the hotspot on your Firefox OS device, you can share your phone’s internet connection over Wi-Fi. For those devices that do not have built-in Wi-Fi, you can still share your connection through the USB port. If you are interested in these features, keep reading. Both options will be covered in this tutorial. 1.Go to the Home screen of your Firefox OS by pressing the Home button. 2.On the Home screen of your phone, scroll through the apps until you find Settings. Tap on the Settings icon to open your device’s settings. 3.On the Network and Connectivity section of Settings, tap on the Internet sharing option. 4.Tap on the Wi-Fi hotspot switch to turn it on. 5.The hotspot Name, Password, and Security type are displayed on the screen. 6.Tap on Hotspot settings to change your Hotspot Name, Password, or Security type. 7.Change the details based on your preferences. 2.On the Home screen of your phone, scroll through the apps until you find the Settings. Tap on the Settings icon to open your device’s settings. 4.Scroll down until you find the USB tethering switch. Tap on the switch to turn it on. 5.Connect the phone to a computer through a USB cord to start sharing your internet connection. You are done. Did you have problems with any of the steps above? Do you have something to share about your Firefox OS device? We would like to hear about it on the comments section below.